The Sound Kitchen, is the listeners interaction show of Radio France international. It is also the weekly quiz zone. Here spectators’ can take chance to test his knowledge and win a RFI Prizes. January 13, 2018 focused on the China visit of the French President and the Big Wild Giant Pagoda. French President Emmanuel Macron started a state visit to China on 08 January 2018. It launched at the starting point of the ancient Silk Road the famous trading route. Ms Brigitte his wife also with Mr Macron visited the famous terracotta warriors in the northern city of Xian, a centuries-old Big Wild Goose Pagoda, a Buddhist site as well as the city’s mosque. Also visited the 8,000-man clay army, crafted around 250 BC for the tomb of China’s first emperor Qin Shihuang. It is a symbol of ancient artistic and military sophistication in a country that proclaims itself a 5,000-year-old civilization. Radio France International aired series of reports on this visit and the Sound Kitchen has two quires one of the visited place. The Big Wild Goose Pagoda or Giant Wild Goose Pagoda is a holy place for Buddhist. It is a well-preserved with a history of over 1300 years. It is the landmark building of Xian, the key national cultural relics and tourist attraction. The whole Big Wild Goose Pagoda scenic area composed with Big Wild Goose Pagoda, Daci’en Temple and Big Wild Goose Pagoda North Plaza. Giant Wild Goose Pagoda is a Buddhist pagoda located in southern Xi’an, Shaanxi province, China. The pagoda was built in 652 during the Tang Dynasty and originally had five stories. Although the structure was rebuilt in 704 during the reign of Empress Wu Zetian and its exterior brick facade renovated during the Ming Dynasty. One of the pagoda’s many functions was to hold sutras and figurines of the Buddha that brought to China from India by the Buddhist translator and traveler Xuanzang. The original pagoda was built during the reign of Emperor Gaozong of Tang. Then standing at a height of 54 m. This construction of rammed earth with a stone exterior facade collapsed five decades later. The ruling Empress Wu Zetian had rebuilt the pagoda and added five new stories. A massive earthquake in 1556 heavily damaged the pagoda and reduced it by three stories. That turned it into the current height of seven stories. The Giant Wild Goose Pagoda extensively repaired during the Ming dynasty and renovated again in 1964. The pagoda currently stands at a height of 64 m (210 ft) tall and from the top it offers views over the city of Xi’an. The Sound Kitchen question of the week for January 13, 2018 is on this Wild Giant Pagoda. 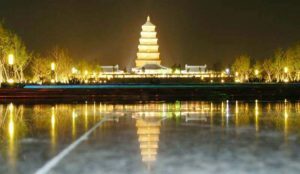 In which city of China the wild big pagoda situated? and when it was built? You have to send your answer before 07 February 2018.